Exeter City Wall was an important feature from Roman to medieval times and is still an interesting and prominent feature of Exeter, Cedric explained to his student. MY email to my journalism trainer, informing him of my visit to London did not get a prompt reply. As the days of my departure drew nearer, I was tempted to send him another note but I remembered how he reacted previously when I reminded him I did not get a reply from him. Well, at least, he was accurate in assessing my thoughts. So, in the meantime, I held back. When I finally resolved to send him another e-mail to all the email addresses available before I left on my trip, there was an immediate response – that he could meet me at Exeter, two hours by train from London. Lo and behold, my itinerary in London had already been planned. However, there was still hope of a meeting with my journalism teacher as my son, the tour guide, had the foresight to plan an early departure from Bath to Exeter, a two-hour drive, and make it a day trip. That meant we still had enough time to tour Bath. The members in our group went along with the idea. So Exeter, here we come after all. With everything confirmed, I dropped Cedric an email. The journalism guru, like most journalists, is very detailed in his planning. He wrote: “We can start to put some ‘flesh on the bones’ of your visit on Wednesday. I can meet you (venue below) any time from 1100, and as I mentioned, there’s a train I must catch at 1530. It turnedout to be a great teacher-student meeting. At 79, Cedric is as active as ever. He sold his apartment in London and bought himself a bungalow by the seaside and a flat in a small town, some one-hour train ride from Exeter and another five kilometres by road. He told me he had an important meeting in the village that night, so he needed to catch the 3.30pm train. He sounded very like the “ketua kampong” of the village. At the long catch-up over coffee in a warm pub called The Ship in this ancient city on the River Exe, Cedric talked nostalgically about the times (2009 and 2010) he conducted training courses for journalists in Kota Kinabalu (Sabah) and Kuching. Indeed, all I needed to know about journalism, I picked up from Cedric. And even seven years later, this media veteran is still as concerned about what I am doing and how his other students are doing. 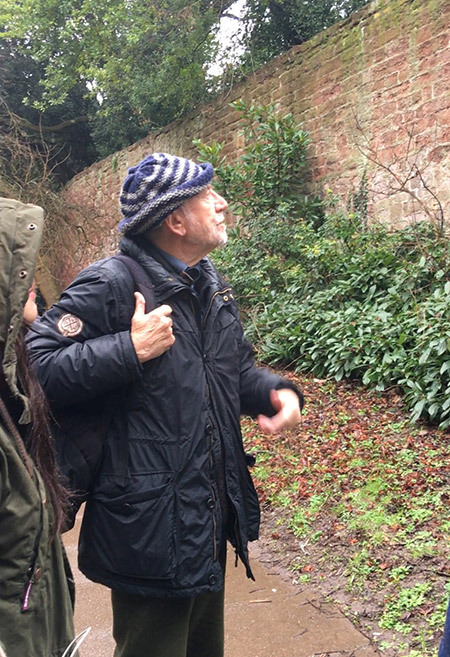 He is also a good tour guide, taking us for a walk along the City Wall Trail. The oldest parts of the Wall, Cedric said, are almost 2,000 years old and the Wall has been the site of many important historical events. Although no longer whole, the City Wall is still an interesting and prominent feature of Exeter. Dating back to the Roman era, the Exeter City Wall surrounds its centre and the Gothic Exeter Cathedral. Exeter Castle, a Norman landmark, overlooks Northernhay and Rougemont Gardens. Walking in the city was the perfect way to see and tour the main places of Interest. The experience was relaxing and unhurried. Cedric told the tour members a fire last October gutted the historic Royal Clarence Hotel, which is thought to be the first hotel in England. Refurbishing and repairs are underway. To what extent the original structure could be preserved is left to be seen. Exeter has many of Britain’s blandest high streets. Chain stores dominate the main shopping street. Of late, I had read in a survey that the city had been branded “clone town.” However, I noticed there was a wide range of independent stores in many of the other streets, especially at the Cathedral Close. Looking through the pub’s window, I saw a man picking up litter from the ground as he walked along and seemed to be humming a tune with earphones plugged. After Cedric had settled the bill and gone to the rest room, the chap from next table walked over for little chat. He asked whether it was my first visit to Exeter and where I was from. “Do you know why this city is called Exeter,” he asked. Honestly, I don’t. It was never my plan to visit Exeter in the first place, so I did not do any research albeit I always do when I am visiting new places. “The Roman arrived in 50 AD and built a fort on a hill near the River Exe. Exe is derived from a Celtic word meaning water. After the Romans left, the Saxons from Germany invaded Eastern England and reached Devon. They built a monastery inside the walls of this old Roman town. The Saxons called every Roman town a ‘ceaster.’ They called this one Exe ceaster. In time, the name changed to Exeter,” the man was quick to tell me before Cedric came back. To this Foochow woman (as how Cedric always calls me), whether it was the man picking up the litter or the stranger trying to tell me about Exe ceaster, there is an enlightened sense on her part that the people in this city take great pride in their communities and the city’s rich history. Exeter misses out on some glory as it is close to Bath with its Romans Baths and Spas and dream backdrops for outdoor pictures which could be missed by tourists. But Bath is another story. Right now, it’s about Ex ceaster, home to a million thoughts with its most distinguished histories of any British city and the wise journalist living not far from it – and I cherish it!